If you are in the Mid-Atlantic, the Wisp ski area is a great mid-sized resort to check out. 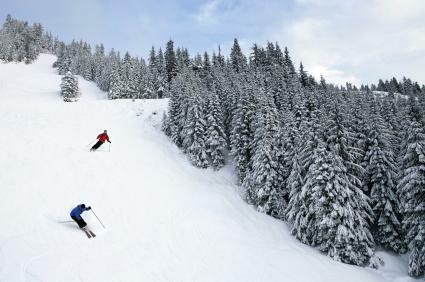 This ski resort has a lot to offer the entire family and is perfect for skiers of all skill levels. Wisp Resort is located in Garrett County, Maryland which is two hours from Pittsburgh, Pennsylvania and three hours from Washington DC. It is located lakefront of Deep Creek Lake in the Allegheny Mountains. It is close to both West Virginia and Pennsylvania. The Wisp ski area sits atop of Marsh Mountain which has an elevation of 3,100 feet. Wisp's vertical drop is 700 feet. The resort averages 100 feet of snow annually and has a state-of-the-art snowmaking system. Most trails are open for night skiing and are groomed nightly as well. There are plenty of options when it comes to rentals. They stock top brands such as Burton, Elan and Rossignol. Don't worry if you don't own your own equipment, the Rental Center can match you up to whatever you may need. Wisp offers a wide variety of lessons tailored to all levels of skiers. They feature the Learn To Ski Program as well as private and group lessons. There is also a Children's Learning Center that helps build confidence and teach the basics of what is needed to enjoy the skiing experience. This program can be either full or half-day. Wisp features a beginner snowboarding program as well. This program is tailored to six and seven-year-olds year olds who are interested in learning the basics of snow boarding. Lessons and equipment are included with this program. There are programs for adults who want to brush up on their skills and learn new techniques as well as those adults who are out for the first time. No matter what your need is, Wisp has a lesson to match it. The Wisp Resort Hotel and Lodge is the perfect place to stay after a long day out on the slopes. The well-equipped rooms are located so that you can ski in and ski out. For those in the Mid-Atlantic, there is no better resort than the Wisp ski area. This resort is packed with fun and adventure and will be enjoyable for the entire family.